This was the first time I had to write a long article. I learned a lot and want to give thanks to The UOS Times reporters who helped me a lot with my writing. You are very precious to me! I’m rooting for you guys. It seems like only yesterday that I entered the University of Seoul, but now I am preparing to become a sophomore. I have spent my freshmen year with The UOS Times. 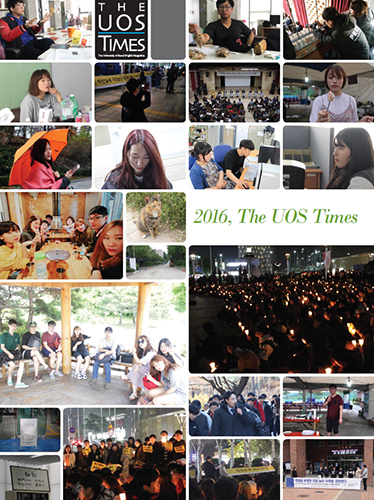 Because I worked as a member of The UOS Times, this year was even more special for me than any other year. I learned a lot of things by covering and writing my own articles. This has helped me get closer to my dream of being a reporter. Also, I will never forget this experience with The UOS Times when my dream comes true in the future. I want to give a lot of thanks to all the people who helped me make invaluable memories, especially to Si-nae Ahn for giving an awesome interview in this issue. Merry Christmas and Happy New Year! Thanks to Movementary, a students’ central club, for their help in writing the Cover Story. It is sad that I was not able to put all the stuff in the article I wanted to. As my second issue of The UOS Times as a vice Editor-in-Chief, this issue was much harder to work on than last year, but the topic was very interesting. I hope to work with fellows in the future. There are as many things to say about this year as there are candles lit in Gwanghwamun Plaza every Saturday. What can and should we do in a nation that does not serve its people, but instead serves for sake of somebody who has never been approved by the public? People will find an answer and fight for it, as they always have. The weather has turned cold like the day I first came to this university. It has already been about a year since I entered the University of Seoul (UOS) and became a reporter for The UOS Times. This makes me look back on how I spent my first year at university. To be honest, I am not really sure whether the things I learned will be important in the future or not. However, I am confident that I have made some improvements. For this issue, I covered the Society article, which is about the cost of the food we waste. The article is definitely longer than the two articles I wrote for the last issue. I believe that being able to write a longer article by myself is proof that I have made progress. If you look back on your last year, you will probably find progress that you have made, as well. For the 141st issue, I wrote about cafe streets in Seoul. At first, this seemed easy to write about. However, it was difficult to visit a lot of different cafes and gather proper information for our readers. I hope they have a great time visiting cafes in Seoul based on “The Place” in the 141st issue of The UOS Times. In this cold winter when people light the night with candles, maybe we need some cocktails to deal with the problems of our society. Although Kazakhstan, the topic of my article, has colder winters than Korea, the current political scandal in our country gives me a terrible chill. I hope there will be a warm spring after this long winter.